Products that may be used in extreme hot or cold temperatures are likely to be used with gloves. For instance, jumping from an airplane at 30,000 feet is cold. Really cold. -50C cold. The kind of cold where taking off gloves is not an option. So removing gloves to work the touch screen of a GPS or manipulate a small control knob is impossible. Extreme cold weather gloves are fairly bulky. The glove finger fabric is typically greater than 5mm thick reducing tactile feedback and essentially increasing the size of fingers, requiring bigger spacing between buttons and larger grip areas. Touch displays are amazing. It’s hard to remember that they weren’t found everywhere just a decade ago. From a product design standpoint, the touch display gives an almost infinite number of control options. Buttons, slides, virtual knobs – all can appear and disappear depending on the use. Physical buttons take up space and are expensive while touch screens have become very inexpensive since they are manufactured in such huge quantities. There are still great reasons for physical controls, for one thing, a touch display requires the user to look at it while operating. That has some down sides – ask anyone who has had an accident while texting and driving. But the benefits of touch screens make them a boon for any product designer. Designing for extreme environments where gloves are used creates a challenge though. Nearly all the touch screens encountered by the average consumer are capacitive touch screens. This means they read the capacitance of your finger and they won’t work while wearing some gloves. Resistive touch screens are less common, more expensive, and less sensitive for fine control. They have the advantage of operating regardless of what touches them. They can also be more easily shielded from EMI (electromagnetic interference). These trade-offs are part of the challenges we navigate every day in designing gear for rugged environments. The GloveTest from Juggernaut on Vimeo. Sometimes physical controls like a joystick can supplement the use of touch screen when they cannot be used. Capacitive touch screens do not work underwater, or in very heavy direct rain, or with extremely thick gloves. Product designers can’t usually dictate what type of protective gear is used alongside a product, but more and more glove manufacturers are adding features and materials that allow their gloves to operate capacitive touch panels. There is also the option of an active stylus to avoid taking gloves off. Gloves reduce dexterity but increase tolerance for rough surfaces. Buttons and knobs must be designed larger for gloved use. Skin has pretty low friction – unless you’re trying to open a jar with wet hands. But cloth gloves slip. Adding a more aggressive texture to controls can help with gloved use, especially on small selector knobs. The distance between controls like buttons must increase with gloved use or there’s a danger that the wrong button will be pushed accidentally. That’s OK if you’re selecting a radio station, less OK if selecting a target. 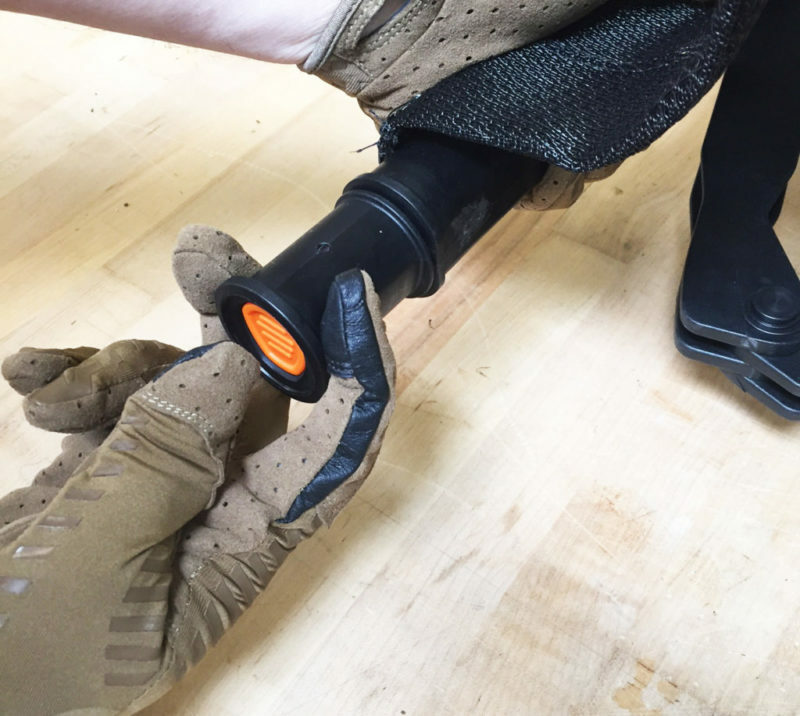 Similarly, the clearance for gripping areas of handheld or hand interface areas needs to increase for gloves. Foam models allow rapid testing of tactile feedback, scale and ergonomics for our THALES Liberty Radio project. Glove testing the final design verifies the decisions made along the way on the THALES Liberty Radio project. Most gloves have some low friction material, but not all. Very sharp textures can aid grip for products used almost exclusively with gloves. If the product is used more often without gloves, sharp textures can be irritating to the skin. Like we mentioned in our article Lessons From the Battlefield Applied to Civilian Gear, there are some things that just can’t be tested on the computer. Gloved use is one of them. 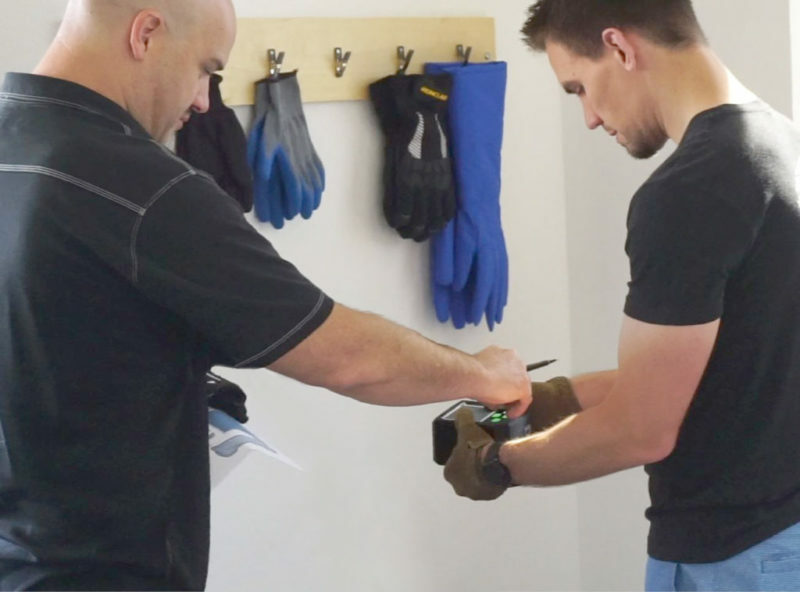 That’s why we have an extensive collection of gloves we use for physically evaluating prototypes. There is no substitute for using the specific types of gloves that users will wear. If you haven’t thought much about gloves, head over to home depot and see how many gloves they have – and that’s just work gloves. Now add chemical protective gloves, medical gloves, cold weather gloves, underwater gloves… all are a little different and need to be tested if they might be used with the product. 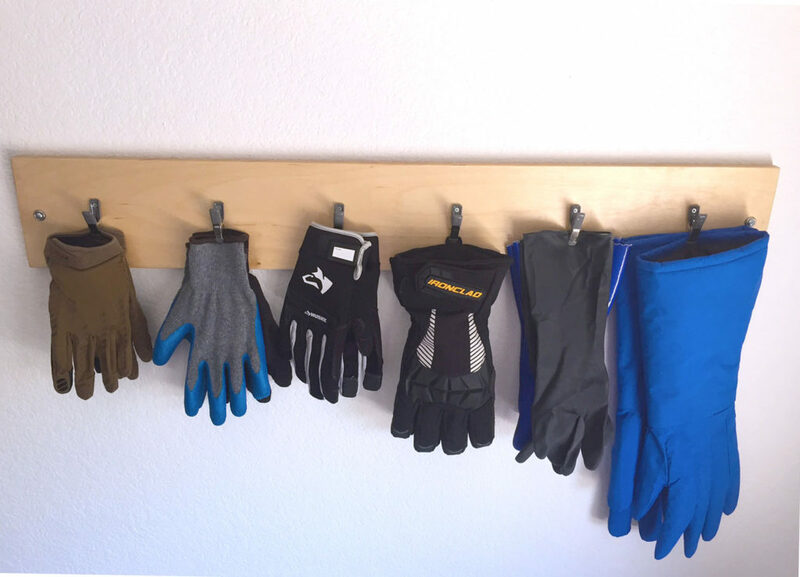 Our glove wall keeps an extensive collection of gloves we use for physically evaluating prototypes. 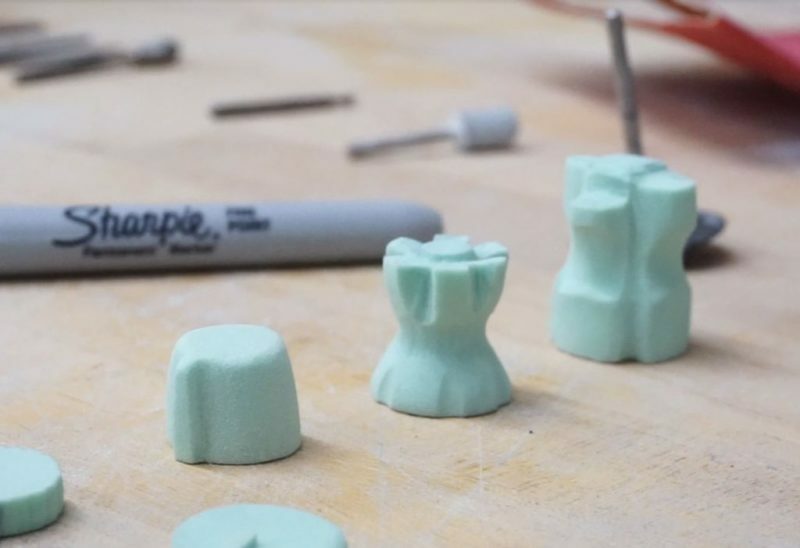 We use a glove sample board during all phases of development – evaluating the competition, proving out designs on foam models, dialing in sizes on working prototypes and final product. We verify size, spacing/pitch, pressure at both macro and micro level. 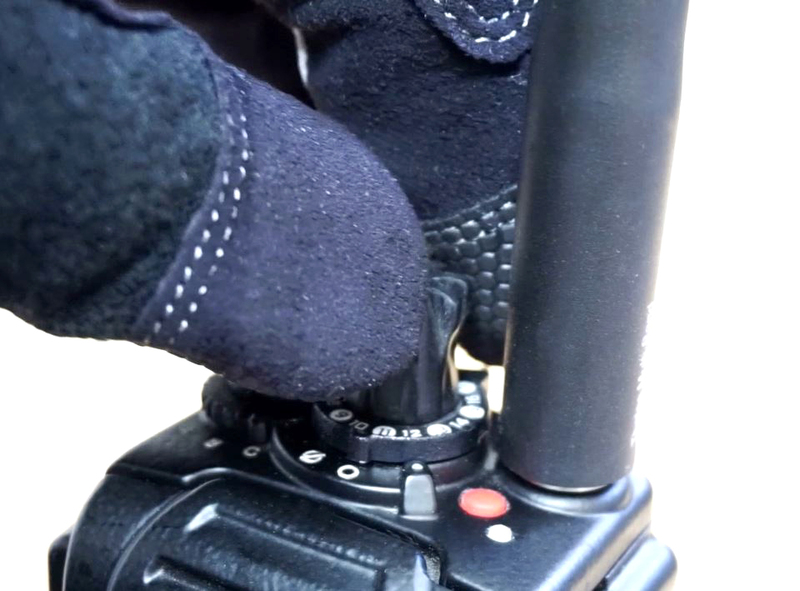 We don’t limit our glove test to small handheld devices, we test all the touch points of the product (grips, release mechanisms, knobs, levers….). Whether entering the coordinates for a target or performing a toxicity test of an unknown substance, a device should not pose a risk of failure due to poor design for gloved use. We glove test everything that we design that could be used with gloves. 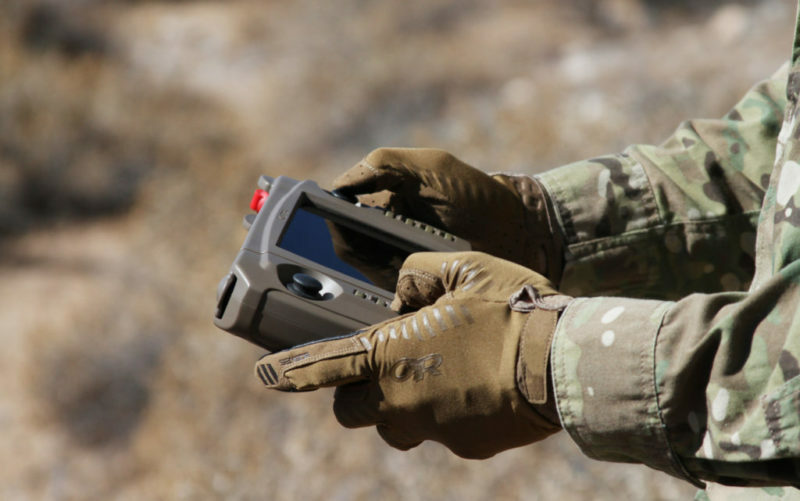 We apply the glove test to handheld point-of-sale devices and military litters alike. Glove testing in the field on our Kutta Technologies UGCS-400 Handheld Controller project. Rugged design requires good decisions based on knowledge of the environment and things used in that environment. Gloves are common in rugged environments. Check out our The Glove Test video to learn more on how we apply good design for products requiring gloved use.